Have so many tapes to transfer to DVD... Gotten about 10 hours done, but that was the easy part...About to tackle the digital tapes from the digital video and the mini-tapes from the analog video recorder. That stuff is not edited, and in rough shape. Will need to transfer it to the MAC, work in i-Movie and then transfer from there to the DVD recorder. Also found out We will be having a guest over the weekend of June 22. Frat brother and best friend Andy coming in after visiting our friend Jamie in California for a few days. My Yankees are really struggling right now. They get hitting and no pitching, or get a good pitched game and can't get a hit...This all started with the rash of pitching injuries early in the season. It put a ton of pressure on their relief staff and those guys are just overworked. GOOD NEWS: Lindsay Lohan does not look up to Paris Hilton as a role model. BAD NEWS: She didn't learn and is still too thick-headed to realize you do not put yourself in a DUI (with "cocaine" found in the car) situation because guess what? It isn't like when the Rat Pack, or the Brat Pack, or even Team DiCaprio were around. Going out for the night? Be our guest in making yourself look ridiculous to the photogs (Oh, yeah, they WILL be there, promise), but hire a freaking car service....PLEASE! He passed away of pneumonia on Friday. "Hollywood Squares" and "The Match Game" in the '70 & '80's. Reilly began his career in New York City, taking acting classes at a studio with Steve McQueen, Geraldine Page and Hal Holbrook. In 1962, he appeared on Broadway as Bud Frump in the original Broadway production of "How to Succeed in Business Without Really Trying." The role won Reilly a Tony Award. He was nominated for a Tony again for playing Cornelius in "Hello, Dolly!" In 1997 he received another nomination for directing Julie Harris and Charles Durning in a revival of "The Gin Game." After moving to Hollywood in 1960s he appeared as the nervous Claymore Gregg on TV's "The Ghost and Mrs. Muir" and as a featured guest on "The Dean Martin Show." They wanted all y'all to know how much they appreciated the support. Will the ramblin' ever stop???? Goodness gracious, darlin'! You are all over the place with this post. Good choice on the tuneage - reflects your post (and your mood I suspect). Hope you have a FAB time with your folks next weekend. I'm sure your mom will give you lots of well deserved love. I like to ramble... in both senses of the word. And I like reading your ramblings. That Italian festival sounds good. Quite jealous. Have fun with your folks!! Have a lovely time with the folks Bond...What frat were you in? My place is a MESS...one adirondack chair together needing one more coat of paint, one I'm just starting. Tools, paint, wood all over the place. lets see, an hour team meeting and then lose 7 to 1, nice. Gravy, thats the tomato sauce right? I want to go to Graceland... I loooove Elvis! SPARKY: Yes gravy is tomato sauce, and I will ignore your other comment. I refuse to make any comments on that baseball thing you speak of. God rest Charles - I knew of him and knew his work. Thank you for the extra info. Don't forget the National Civil Rights Museum, if your parents are museum types. And CNR was the shiznitz. I recall this cleaning thing you speak of - but I think I still have too much to put away before I have any floor to vacuum. Can't wait to get started on my analog to digital project. Enjoy the folks and your time with Andy. Family and friends - that's the fun part. I can say this here cause I'm amongst friends - I despise the Red Sox. The Yankee spiral wouldn't be so bad if the Sox were tanking worse. I hadn't heard about Mr Reilly. He was always one of my favorite regulars on Match Game. Him and Richard Dawson. I wasn't aware of his other credits - thanks for that. Don't worry about the rambling. Matt Man wouldn't have to ask you what frat you were in if he were a real fan of the Radio Happy Hour. MATT-MAN: Is that really a frat? One of those tiny little frats? Oh I'm not talking any baseball this year either... what the hell has happened???? WOOOOOOO Bond Rambles ... just love those posts. Man, I loved CNR. 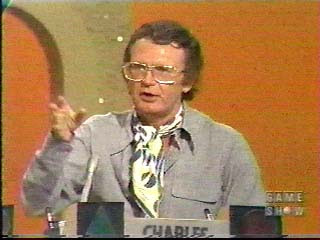 I have to say, most of what I know of him comes from the Match Game, but he and that lady (what was her name? My mind went blank - oh, Brett) just clicked! I was bummed about CNR. Cool guy. You like the Yankees?? Eeeee-yuck! Oh, the celebrity hijinks make me want to puke...and Rosie--she's just as bad as Lohan et al--her's is just a different brand of BS. Hers is the Ooh-let's-see-if-I-can-make-the-network-news-with my-feud-of-the-week-crap-cuz-I've-got-a-CAUSE-y'know! 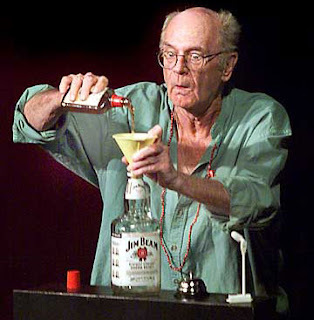 Loved Charles Neslon Riley--*sniff* he was a good egg, and funny! Enjoy your time with Mamma and Pappa Bond, too!! Look out Memphis... the boys'll be on the loose! Hugs, smooches and gropes to you and Andy!